An engineered wood product used in construction projects and composed of wood chips, sawmill shavings, and/or sawdust and a suitable binding agent, such as resin. 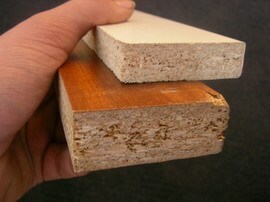 Oriented strand board (OSB) is very similar, but offers more strength as it uses machined wood flakes. Particle board has more uniformity and is denser than wood and plywood. It will not bow or warp like the latter. However, it may swell and lose stability if exposed to water. Laminate and veneer are common finishes. Particle board is cheaper than plywood. Custom closet systems made of particle board may run from as little as $75 for a prepackaged kit to $600 for a custom-designed laminate version with drawers and other additional features.